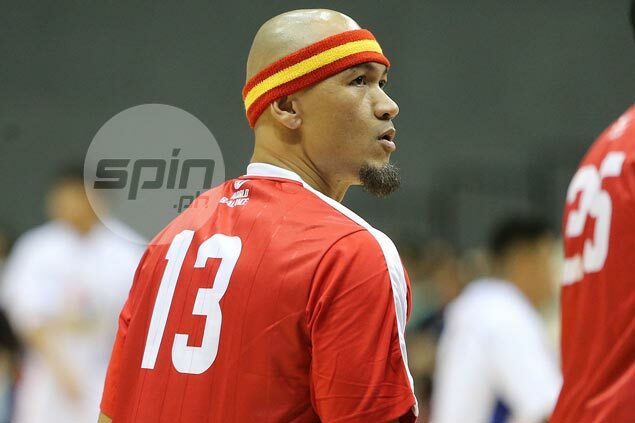 BOCAUE – Mark Caguioa is paying the ultimate tribute to his close pal JayJay Helterbrand. The veteran Barangay Ginebra player is setting aside his trademark jersey No. 47 in favor of No. 13 as a show of respect for his retired former backcourt partner with whom he won several championships with the Gin Kings. Caguioa posted on Instagram his Ginebra jersey bearing the celebrated number of his bosom buddy just before tipoff between the debuting Kings and Magnolia Hotshots during the PBA Philippine Cup Christmas Day game at the Philippine Arena. “I’m gonna be wearing this for one conference as a tribute to @jayhelterbrand. Merry Xmas to everyone,” said the former league MVP in the accompanying caption of the jersey photo. A check with PBA officials confirmed Caguioa requested that he be allowed to switch jersey numbers in this all-Filipino conference, which marks the first year Helterbrand won’t be playing since retiring at the end of last season. The Christmas Day game is also the first time Helterbrand won’t be around during a Christmas-Day game. As per PBA chief statistician Fidel Mangonon III, the 2009 MVP holds the most number of games played on Christmas at eight, which he shared with former teammate Eric Menk.